We often talk of "stepping into someone else's shoes." Walking back in time a century ago, which shoes would they be? A pair of silk sensations costing thousands of pounds designed by Yantonnay of Paris, or heavy wooden clogs with metal cleats that spark on the cobbles of a factory yard? Would your shoes be heavy with mud from trudging along duckboards between the tents of a frontline hospital, or stuck with tufts of turf from a soccer pitch? 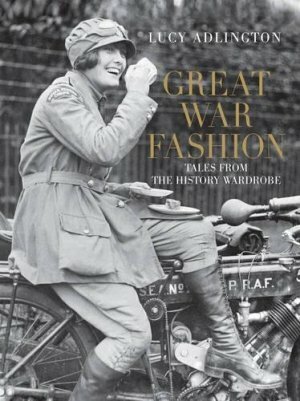 This history follows the revolution in women's lives and aspirations during the second decade of the 20th century, as reflected in costume and appearance. The book opens the wardrobe in the years before the outbreak of war to explore the contrast between the stiff, mono-bosomed ideal of Edwardian womanhood and the gossamer gowns draped round her. It examines such contradictions as suffragettes battling social and legal restrictions while fashion literally hobbles women with narrow skirts and thigh-length corsets.